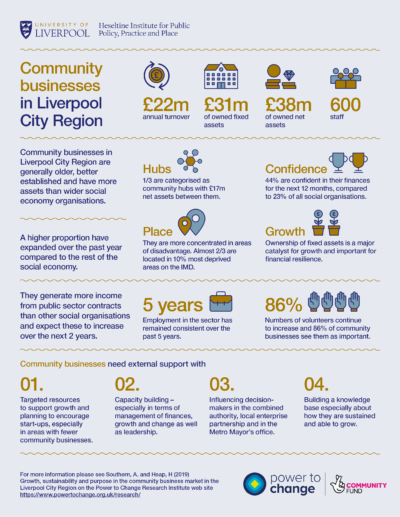 This report builds an evidence base that demonstrates how growth can be achieved in the community business market in Liverpool City Region. Based on a database of community businesses, semi structured interviews and a survey, the report finds that the community business market in the region is significant. The authors call for further support to help grow the sector. This report was produced by Hesletine Institute for Public Policy, Practice and Place at the University of Liverpool who successfully won funding from Power to Change’s open call for research grants. Please save and share the key findings below.